INTEGRATED’s suite of CAE software products provides a complete toolbox to simulate various aspects of sensor design and electromagnetic effects involved in their systems. These programs provide the most accurate results for ﬁeld plots, ﬂux linkage, inductance calculations, force, torque, power loss and stored energy. Effects of induced currents and/or transients, current densities in conductors for steady state sinusoidal sources or for completely general user deﬁned transient signals are handled explicitly. Both skin effects and proximity effects are included as part of the ﬁeld solution. Our proprietary Boundary Element Method (BEM) is often the preferred method for optimizing sensor design and is best method to handle both large regions of open space and small air gaps. BEM requires neither artiﬁcial boundaries to limit the model space, nor meshing of empty space regions. Finite Element Method (FEM) is also incorporated in the programs at no extra cost. FEM is particularly well suited to transient simulations, which involve the ﬁeld solution at a large number of time steps. An additional advantage to having both solution methods is the ability to conﬁrm the validity of models using two independent solvers based on entirely different mathematical formulations. Direct import of models from CAD Partners including: Autodesk, PTC, Solid Edge and SolidWorks (also STEP, SAT and openNURBS (.3DM) import from general 3D CAD programs). Sensors are the key components of measurement, monitoring and control systems. In particular the precision of a control system cannot be greater than the precision of the sensor used to measure the controlled variable. Electromagnetic principles are at the heart of many types of sensor systems. In some cases the variation of an electromagnetic parameter is directly related to the measured quantity as in the case of a capacitive position sensor. In other cases electromagnetics are used indirectly as in the case of the magnetic pickup of a turbine flow meter. Even in cases where electromagnetics play no role in the measurement process, they may be an important consideration for the safe operation of the system as in the case of high voltage systems which must be protected by adequate insulation levels. 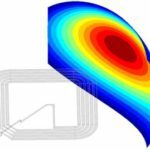 CAE software is an essential design tool for any sensor system that requires analysis of electromagnetic fields. Without the insights that only CAE software can provide, the design process will almost always revert to inefficient and expensive trial and error prototyping. Sensors employing interactions of electric fields are often used in area requiring high precision measurements. Static, phasor, or completely general transient electric fields can be simulated using ELECTRO (if 2D or Rotational Symmetric) or COULOMB (where full 3D analysis is required). Both programs provide a complete range of analysis options including field plots and capacitance calculations. Force, torque, and stored energy can also be calculated. Magnetic Field Analysis is at the heart of many sensor systems, particularly systems with large air gaps. These applications can be easily modeled using MAGNETO (if 2D or Rotational Symmetric) or AMPERES (where full 3D analysis is required). Both programs provide a complete range of analysis options including field plots, flux linkage and inductance calculations. Force, torque, power loss and stored energy can also be calculated. In the case of LVDT sensors, Usually OERSTED (2D/RS) or FARADAY (3D Simulation) will be required because of eddy currents induced in the sensor components. If the sensor is composed of ferrite and/or laminated materials, MAGNETO (2D/RS) or AMPERES (3D Simulation) should be sufficient. Eddy Current sensors are employed in a wide range of applications, particularly in the field of Non Destructive Testing. Effects of induced currents and/or transients can be simulated using OERSTED (if 2D or Rotational Symmetric) or FARADAY (where full 3D analysis is required). Current densities in conductors can be calculated for steady state sinusoidal sources, or for completely general user defined transient signals. Both skin effects and proximity effects are included as part of the field solution. True AC resistance and power loss of coils can be obtained. In addition OERSTED and FARADAY contain the full capabilities of MAGNETO and AMPERES (respectively) in cases where only static analyses are required. Sensors based on high frequency electromagnetic radiation and scattering effects can be modeled in SINGULA and/or CHRONOS. SINGULA is a frequency domain field solver while CHRONOS is based on the Finite Difference Time Domain (FDTD) method. Both programs provide near field and far field analysis results, as well as impedance, admittance and scattering matrices. INTEGRATED’s suite of CAE software products provides a complete toolbox for sensor designers who must consider electromagnetic effects in their systems. White Paper:"Electromagnetic Sensor Design: Key Considerations when selecting CAE Software"